A monk collects flowers and candles presented during a merit making ceremony at Wat Phra Phutthabat in Saraburi province of Thailand. I went up to Saraburi today to witness the beginning of what is widely called "Buddhist Lent" or in Theravada Buddhist tradition, Vassa. The three-month annual retreat during the rainy season is observed by Theravada monks and nuns. Wat Phra Phutthabat is highly revered in Thailand because it houses a footstep of the Buddha. On the first day of Vassa (or Buddhist Lent) people come to the temple to "make merit" and present the monks there with dancing lady ginger flowers, which only bloom in the weeks leading up Vassa, and only around this temple. They also present monks with candles and wash their feet. During Vassa, monks and nuns remain inside monasteries and temple grounds, devoting their time to intensive meditation and study. 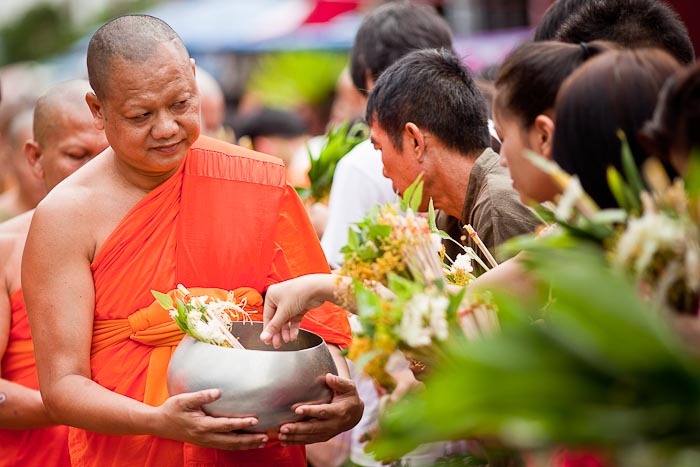 Laypeople support the monastic sangha by bringing food, candles and other offerings to temples. Laypeople also often observe Vassa by giving up something, such as smoking or eating meat. For this reason, we in the West sometimes call Vassa the "Buddhist Lent." The tradition started in the early days of Buddhism when the Buddha's arhats (disciples) would wander the Indian countryside without a permanent home spreading his teachings. Travel during India's rainy season as a homeless preacher was difficult so the disciples would meet up and form temporary communities. These temporary communities evolved into the Buddhist temples of today. There were thousands of people at the temple this morning. It was an amazing experience and, on my next to last full day here, seems like the perfect way to close out this trip. There are more photos from the beginning of Vassa in my archive or available from ZUMA Press.